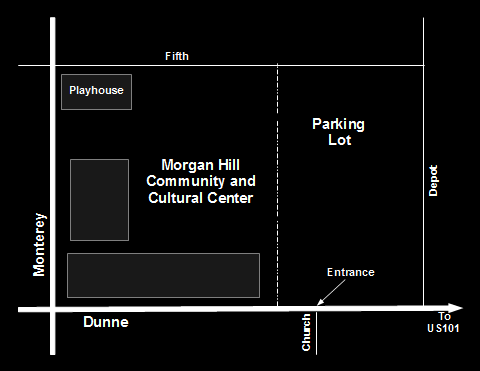 The Morgan Hill Community Playhouse is located at 17090 Monterey Road, at the SE corner of Monterey Road and 5th Street. (This is just north of the Morgan Hill Community and Cultural Center, located in downtown Morgan Hill at the corner of Monterey Road and East Dunne Avenue.) See map. South Valley Civic Theatre is the resident theater company of the Morgan Hill Community Playhouse. 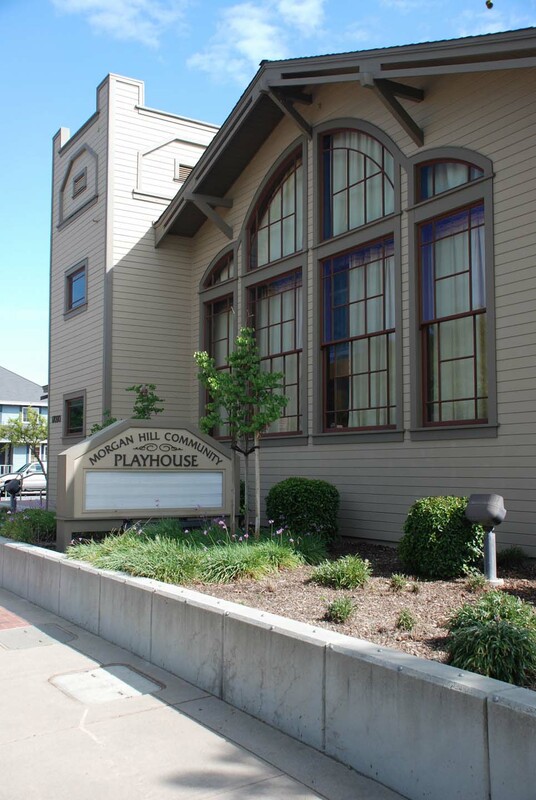 Originally built in the 1920’s as an Arts and Crafts style church, the Playhouse was beautifully renovated by the City of Morgan Hill and re-born into a modern, 186 seat performance facility in 2002. The Playhouse is wheelchair accessible, with removable seats in the front rows. Assisted listening devices are available (ask at Will Call as you enter the theater). Cushions are also available for those who prefer a little softer seat. The Box Office and lobby open one hour before each performance. Tickets purchased online (through Brown Paper Tickets) can be picked up at that time. Seating is open, with the house opening 1/2 hour before the performance. Typically evening performances are at 8 pm and Sunday matinees are at 2:30 pm, but please verify times when purchasing your tickets. Take 101 to Morgan Hill. Take the East Dunne exit and turn west onto East Dunne. (You will make either a right turn if coming from the north or a left turn over the freeway if coming from the south.) After crossing the railroad tracks and then Depot Street, turn right into the large Community and Cultural Center parking lot. After parking, walk to the north end of the parking lot and turn left onto 5th Street. The Playhouse will be on your left at the corner of 5th and Monterey. If the Community Center parking lot is full, another close alternative is the new parking garage located between 3rd and 4th Streets. The entrance is on 4th Street (just one block north of the Playhouse), also between Monterey and Depot. There is also free street parking. However, as a courtesy, we ask that you please not park across the street from the Playhouse in the restaurant parking lot. If you are attending an SVCT production on a Friday night in the summer, be aware that Morgan Hill has a popular summer music series on Friday nights at the amphitheater adjoining the Community Center parking lot. Please plan on arriving a few minutes earlier with the assumption that you will need to park a little further away. Morgan Hill has many wonderful restaurants, including a great selection within walking distance of the Playhouse. Particularly if you are coming from out of town, you might want to consider dinner before or after the show. Click here for a Morgan Hill Chamber of Commerce restaurant list. If you have additional questions, please contact us either by phone at 408-842-SHOW (leave a message) or email at SVCT@SVCT.org. Enjoy the show! All content © South Valley Civic Theatre 2018. SVCT is the resident theater company of the Morgan Hill Community Playhouse (17090 Monterey Road, Morgan Hill) and a 501(c)3 nonprofit community organization.